Recently I was presented with a mathematical dilemma that struck a particular cord with me as a Mason, and as I wrapped my mind around its mystery, mathematically I found myself discovering truths in its symbolism that are very relevant to every Mason and worthy of being shared. So what was the mathematical dilemma I was presented with? In short, it was a geometric construction that appeared to indicate that the infinite constant Pi was not 3.14159 as we all know, but rather simply 4. 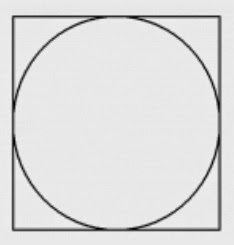 To begin, let’s imagine a circle with a diameter of 1, bounded by a square of width and height of 4 as shown to the right. As we repeat this process again, and again, we soon can no longer distinguish the difference between our ashlar and the circle, and through this can claim that with enough effort our ashlar can indeed be sculpted into that perfect circle. The quandary however is that in this process, no matter how many times repeated, results in the perimeter of our circle not equaling the infinite Pi , but our original square’s perimeter of 4! How can this be so? Without getting into the Calculus behind the flaws of this experiment, what you need to know is that our process only yields Pi when the process is extended to infinity. How does this relate to us as Masons? To begin, let us consider the geometries we have employed in this allegorical example. From time immortal to today, philosophers and mystics have associated the circle with the Devine, infinite in its representation. Indeed the value of the circle can never be truly known, and as shown by Pi, is truly infinite in its perimeter. The square however is of a finite construction; unlike the circle its perimeter can be known and achieved. It is easy to understand in this light why the circle was regarded as Devine while the square was left to the material world -- the square is the work of men’s hands. With this in mind, we know as Masons we are taught to perfect our ashlar, a task that can take a lifetime itself to achieve. However, like all endeavors, perfection of our ashlar should be planned if we are to achieve it – and herein lies the lesson taught by the allegory of the circle within a square. While our goal as Masons may be to perfect our ashlars, the definition of perfection we strive to achieve must be an imperfection itself to ever succeed. No matter how we try, we will never with our finite means be able to mold our ashlar into the perfection of the Architect’s circle, because it can only be fashioned by the infinite itself . Thus, it is important in our Masonic lives that we define the ashlars of our life within the bounds of what is capable of the fallible hands of man to achieve if we hope to ever to achieve it. To put it another way, we are taught to exist within the bounds of our compass, but in truth it is equally important to only seek perfection within the means of the square. Seeking any true measure of perfection of our selves as man, just as our attempt to reproduce the perfection of the circle, is impossible. In fact, attempting it is a task with no end, and one that ironically will never produce even close to the correct result. The allegory demonstrates only the infinity of the GAOTU can achieve real perfection. As we as Masons draw our plans on our tressel boards, we must ensure the inherent imperfection of those plans is fully acknowledged and embraced in our own eye if the temple is ever to be completed, or achieve the perfection we do have the working tools to reach. Nice piece. You really had me concerned until the 4th paragraph, though.